The year was 2007. Twitter was still fairly young, and was used by mostly the techie crowd. For BarCampMilwaukee2 I put together a bit of code using Perl, cron, HTML/CSS and ended up with this kiosk-sort of thing that we projected on the wall during the event. Here’s a mock-up of what it looked like. 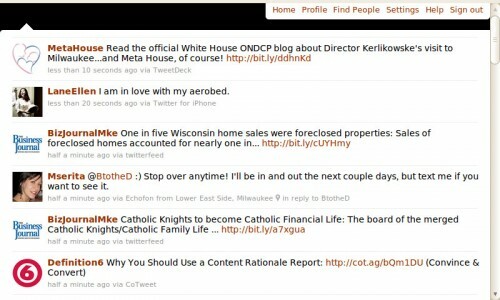 I had just started testing it around August 2007 using the @web414 account on Twitter. Oh, keep in mind that there were some apps do to this sort of thing back then, but most were written in Flash, or AIR or something else that required specific hardware/software that I couldn’t use for whatever reason. Oh, and just a bit of history, I’ve been building kiosks out of old machines since 2002 or so. These are machines that would find no other use, so I do my best to put them to good use. 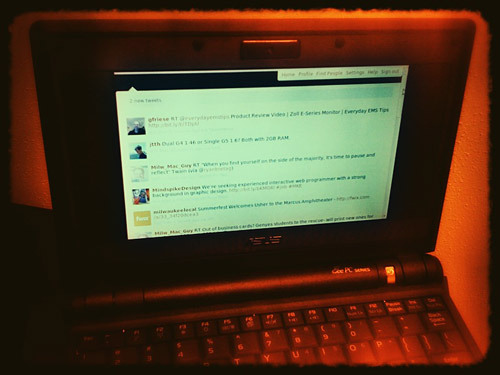 I’m (currently) running EasyPeasy on the Eee PC, and it can run Adobe AIR apps, so I figured I’d give TweetDeck a try. Sure it’s in beta, but what isn’t, eh? Anyway, while TweetDeck is a nice app, it’s infuriating that it can’t display one really wide column. I know it’s infuriating because it’s a feature people seem to ask for in the support forums. TweetDeck wasn’t doing it for me. Next up was Spaz. 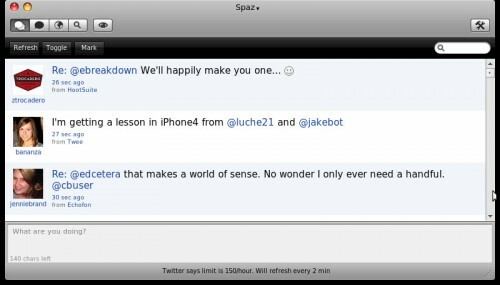 I really like all the ideas behind Spaz, it’s a nice little application. You can even edit the CSS to tweak the interface. That’s a handy feature! I didn’t do much with the CSS tweaking, as I just wasn’t feeling it with Spaz. There was a lot of application UI to deal with, and I didn’t feel like tweaking an AIR app that much. Still, Spaz is nice for what it does. 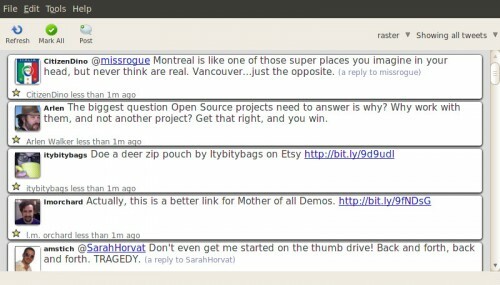 The developer’s blog has some Twitter gripes, but then, who doesn’t!? Next up was Buzzbird, an XULRunner-based application. If you’ve never hear of XULRunner, it’s basically a method of building applications the same way Firefox and Thunderbird are built, using XUL to create the interface. This is a technology I really wish we would have seen take off a bit more, as it’s great to work with. 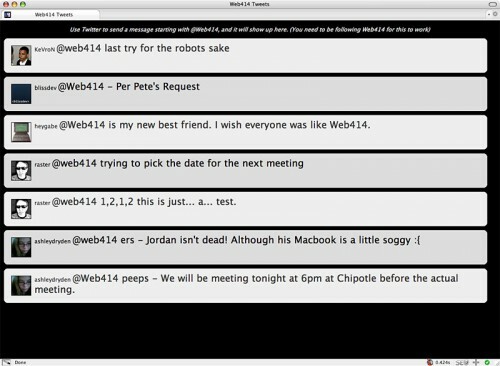 Giving the CSS a tweak in Buzzbird was simple. 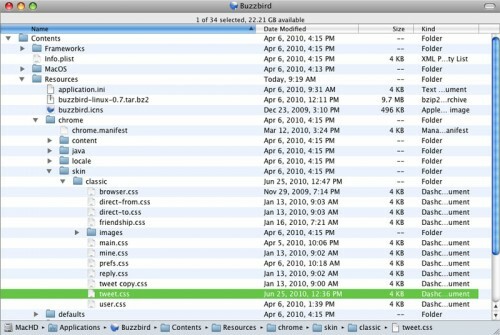 Inside the Buzzbird folder (under Linux) is a chrome folder, and in there is a skin folder, and in there is a classic folder. CSS and images live there. If you’re using a Mac, you just do the right-click ‘Show Package Contents’ trick and drill down a little bit. Also, if you are using Mac OS X 10.6 Buzzbird does not work (as of my writing this) though it does work on Mac OS X 10.5. So besides ReloadEvery we’ve also got Stylish installed, which lets us easily tweak the CSS for any web site. It’s pretty simple. So after just a little bit of CSS hacking (and I mean a little, I really didn’t spend much time on it) we’ve got a look that minimizes some of the stuff we don’t want to see, and emphasizes more of what we do want to see. 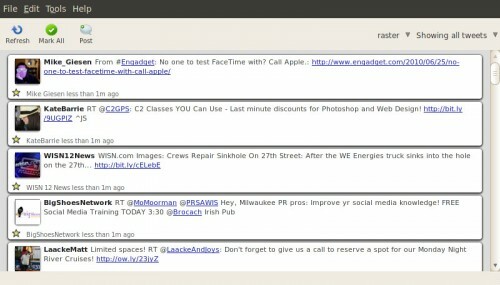 Here’s the CSS for “Twitter Kiosk” I put into Stylish. It’s not perfect. As you can see the page is still showing the notification of new tweets, and some of the links at the top. I didn’t bother trying to get rid of those bits, but it should be pretty trivial to hide them as well. Anyway, this thing is ready to run, and can just exist on the Eee PC sitting on my desk, or be connected via VGA to a larger external monitor, projector, or television. And best of all, it works in Firefox, which is everywhere, and requires just two extensions, and a little bit of CSS. Note: This was all written before #newtwitter happened, so I’m not sure any of it will still work. If it does, let me know… thanks! Posted on Wednesday, June 30th, 2010 at 12:05 pm. Subscribe to the comments feed. Both comments and pings are currently closed. Post on your own blog. Cool project! Thanks for checking out Spaz. I need to integrate either Facebook or twitter to a kiosk application. The main problem here is that there is no physical keyboard so any typing is dependent on a virtual keyboard built in Flash. This poses a problem with logging into Facebook or Twitter accounts in order to post information to the users account. If anyone has done this for either Facebook or Twitter please let me know.